Built as an F.3, XR728 first flew on 17th March 1965, being delivered to Warton for storage until converted to an F.6 and then delivered to 23 Squadron in November 1967. She also served with 5, 56, and 11 Squadrons and the LTF, finishing her career with the LTF as the Binbrook Station CO's personal aircraft (hence the 'JS' coding on the fin). After retirement she was bought by the Lightning Preservation Group and her final flight was to Bruntingthorpe on 24th June 1988. XR728 is very well looked after by the LPG and performs regular fast taxi runs on the long runway at Bruntingthorpe airfield. 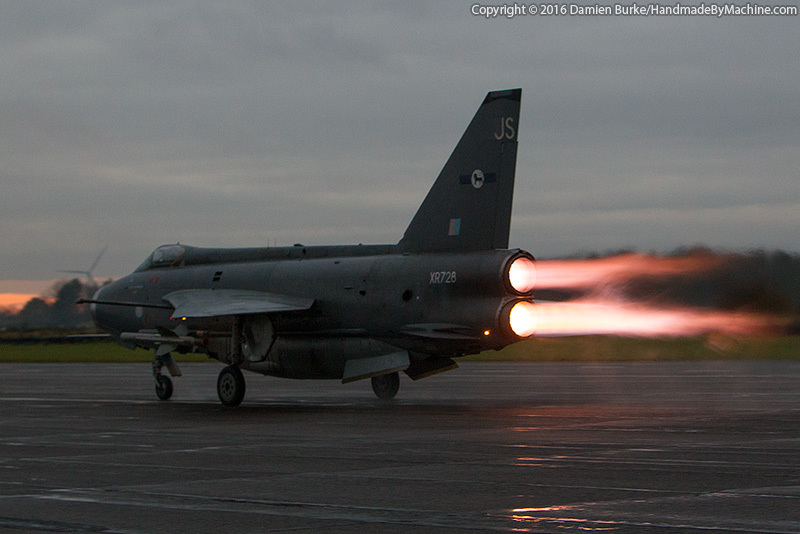 She's seen here at the Twilight QRA Day, November 12th 2016. Check out the LPG website for details of open day dates when you can see the LPG's pair of Lightnings performing. Just remember your ear defenders, a Lightning going past 30 feet away with both burners lit is a noisy beast to say the least!